Why is it so hot?! I almost feel personally offended when the weather doesn't immediately switch to autumny as soon as September the first rolls around. I've been wearing t-shirts this week! I want to be wearing my leather jacket with the fake fur collar, not short sleeves! However the sweatfest of this week has allowed for one good thing- the extension of the ice cream & lollies season. Before we see selection boxes in the shops (& yes I've seen the Quality Street in supermarkets already), I went along to my bestest shop which I love so much, Marks & Spencer, to pick out my favourites from the whole Spirit of Summer season, which you can catch too before they leave stores in a few weeks. 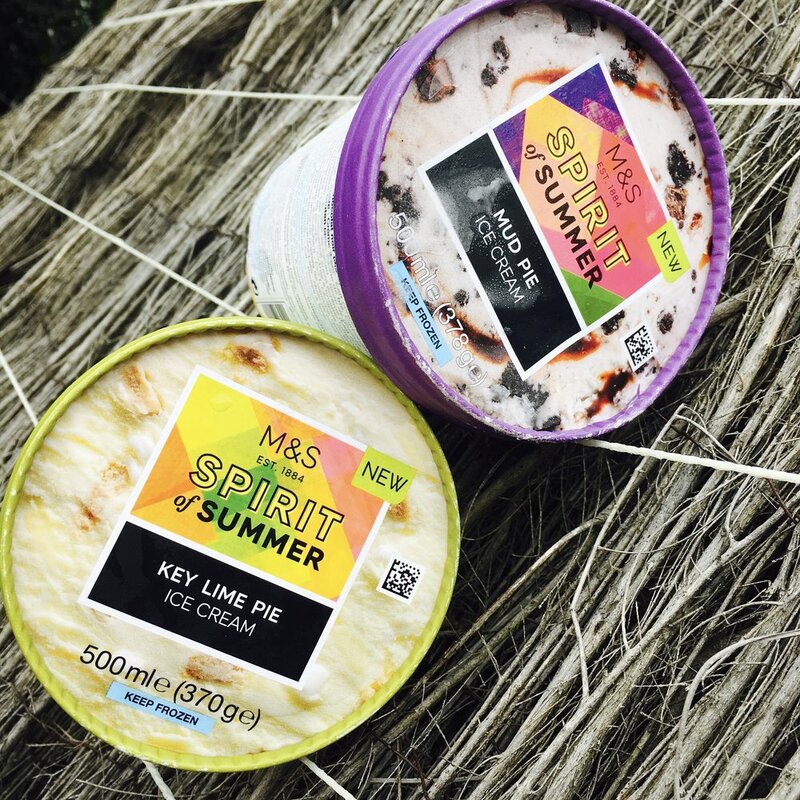 The two Spirit of Summer ice creams are fab, and this was actually my first time trying them. 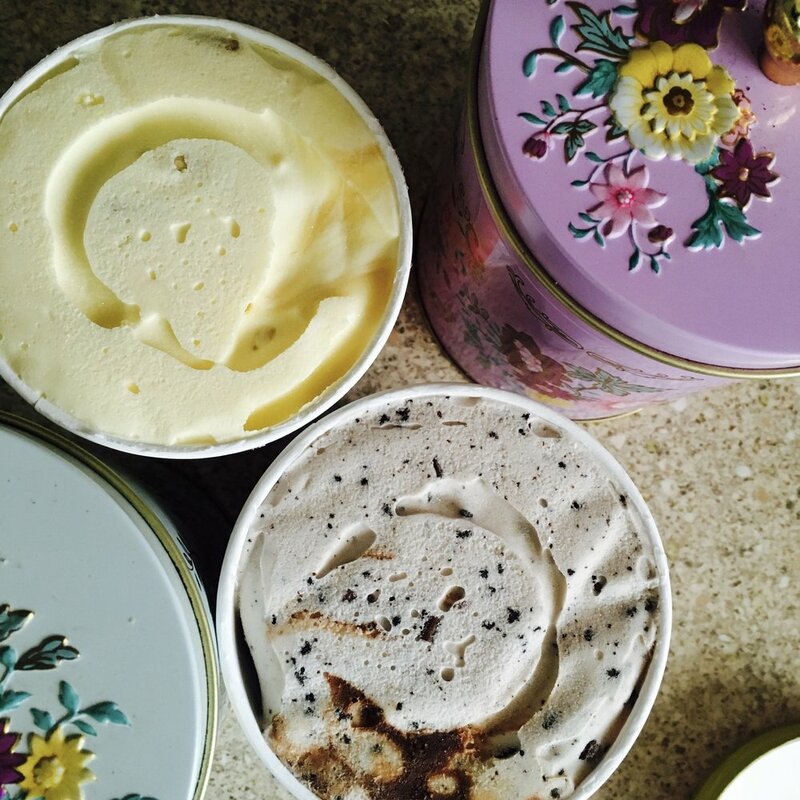 The quality is great, very creamy, and both have biscuit throughout, so if you like Ben & Jerry's loaded style ice cream, you'll love these. Now below we have something really special. I first bought a M&S BBQ pulled pork Mac n cheese in June, and I fell in love. I had a three pack a week habit at one point. This stuff is like cheesy crack. The thought of it not being in store soon gives me the sweats. Luckily, I can bulk buy and freeze them, and I will be doing that. The £3 pack serves one person & can be whizzed in the microwave in a couple of minutes. It's true love. I know you can find mozzarella sticks all year round, but these are particularly good, and one of Smix's favourites. Also £3. Now I sort of sunk myself casually picking up these reduced £1.25 Alfajore biscuits, because when I tried them I was like, "oh okay now there's something else I have to bulk buy before Spirit of Summer ends!" 😂 There are only maybe 8 biscuits in a pack, but they are really super sweet & you would feel sick if you ate more than two (yeah, I ate three). But they are so good! M&S why do you have to torture me with these seasonal deliciousnesses? I haven't tried the cashews yet, but the heat of the jalapeño with the coconut was something I couldn't pass up. The bag was a pricy £3.50, but that's typical for cashews really. Now the Blacksticks velvet seems to be a new product, at least to my local store. I love the darker coloured variety, so I'm keen to see what this is like. Hold your horses, I'm about to tell you something from M&S that I DIDN'T like. I know, it feels like I'm cheating on a boyfriend. I had forgotten my previous purchase of the snacking chorizo, but after eating it I remembered. It may just be me but I can taste a slight fishiness to the mini-sausages and I just can't get past it. I chose them because I wanted to feature snacking items, so let's move on to those. These little £2.50 picnic boxes are great even leading into autumn, as you could as easily heat the dinky bites as enjoy them cold. The pork and apple bites are particularly good. Like mini-scotch eggs but with an apple sauce filling. If you've a suddenly starving growing boy like I have, you could even throw something like these in for break time with some fruit. A sad goodbye to the 3 for £7 Spirit of Summer meats. So many BBQ and spicy goodies that have been protein-snacking ideal all summer. The Diablo chilli beef is a favourite. It actually looks like ham, and it's a medium to hot heat- if you can handle a Nandos you can handle this beef. And so long microwaveable £3 subs! These are so easy to whizz for lunch, but I have a feeling there will be a version of them still on shelves after the Spirit of Summer departs. If you are dieting, keep an eye on the calories of these, but it's a warm, hearty snack without any fuss, and I love that. Finally there's always time for crisps and dips. The Spirit of Summer flavours play through from the deli products and dishes with crisps in BBQ and spice flavours that you'll want to eat all year round. Don't forget to stock up on all your favourite Spirit of Summer products before they phase out over the next two months. I'll fight you for the last Mac n cheese.